Memento mori is the medieval Latin Christian theory and practice of reflection on mortality, especially as a means of considering the vanity of earthly life and the transient nature of all earthly goods and pursuits. It is related to the ars moriendi and similar Western literature. Memento mori has been an important part of ascetic disciplines as a means of perfecting the character by cultivating detachment and other virtues, and by turning the attention towards the immortality of the soul and the afterlife. The skeleton is the body part that forms the supporting structure of an organism. It can also be seen as the bony frame work of the body which provides support, shape and protection to the soft tissues and delicate organs in animals. There are several different skeletal types: the exoskeleton, which is the stable outer shell of an organism, the endoskeleton, which forms the support structure inside the body, the hydroskeleton, and the cytoskeleton. The term comes from Greek σκελετός (skeletós), meaning 'dried up'. Erwin Panofsky was a German-Jewish art historian, whose academic career was pursued mostly in the U.S. after the rise of the Nazi regime. In monumental architecture, cadaver tombs were a departure from the usual practice of showing an effigy of the person as they were in life. An early example is the famous effigy on the multi-layered wall-tomb of Cardinal Jean de La Grange (died 1402) in Avignon. Jean de La Grange was a French prelate and politician, active during the reigns of Charles V and Charles VI, and an important member of the papal curia at Avignon, at the time of the Western Schism. He was the brother of Étienne de La Grange, an advisor to the king and president of Parlement. The Cadaver Tomb of René of Chalon is a late Gothic period funerary monument, known as a transi, in the church of Saint-Étienne at Bar-le-Duc, in northeastern France. 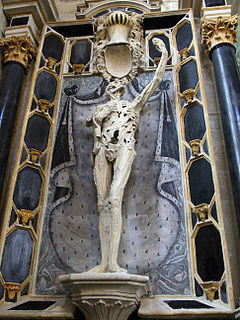 Consisting of an altarpiece and a limestone statue of a putrefied and skinless corpse which stands upright and extends his left hand outwards. Completed sometime between 1544 and 1557, the majority of its construction is attributed to the French sculptor Ligier Richier. Other elements, including the coat of arms and funeral drapery, were added in the 16th and 18th centuries respectively. The earliest known transi memorial is the very faint indent of a shrouded demi-effigy on the slab commemorating John the Smith (c.1370) at Brightwell Baldwin (Oxfordshire). In the 15th century the sculpted transi effigy can be identified in England. Cadaver monuments can be seen in many English cathedrals and some parish churches. The earliest surviving one, in Lincoln Cathedral, is to Bishop Richard Fleming who founded Lincoln College, Oxford and died in 1431. Canterbury Cathedral houses the well-known cadaver monument to Henry Chichele, Archbishop of Canterbury (1414–1443). Exeter Cathedral houses the 16th-century tomb of Preceptor Sylke, inscribed with: 'I am what you will be, and I was what you are. Pray for me I beseech you'. Winchester Cathedral also has two cadaver tombs. Brightwell Baldwin is a village and civil parish in Oxfordshire, about 4 1⁄2 miles (7 km) northeast of Wallingford. It was historically in the Hundred of Ewelme and is now in the District of South Oxfordshire. The 2011 Census recorded the parish's population as 208. A cathedral is a Christian church which contains the cathedra of a bishop, thus serving as the central church of a diocese, conference, or episcopate. The equivalent word in German for such a church is Dom ; see also Duomo in Italian, Dom(kerk) in Dutch, and cognates in many other European languages. Churches with the function of "cathedral" are usually specific to those Christian denominations with an episcopal hierarchy, such as the Catholic, Anglican, Orthodox, and some Lutheran and Methodist churches. Church buildings embodying the functions of a cathedral first appeared in Italy, Gaul, Spain and North Africa in the 4th century, but cathedrals did not become universal within the Western Catholic Church until the 12th century, by which time they had developed architectural forms, institutional structures and legal identities distinct from parish churches, monastic churches and episcopal residences. Three other monuments are those of Cardinal Matteo d'Acquasparta (Matthew of Acquasparta) at the Santa Maria in Aracoeli,  the tomb of Bishop Gonsalvi (1298) and that of Cardinal Gonsalvo (1299) (both located at the Basilica of Santa Maria Maggiore), all sculpted by Giovanni de Cosma,  the youngest of the Cosmati family lineage. Le Transi de René de Chalon , Church of St. Étienne, Bar-le-Duc, France. Sculpture by Ligier Richier. France has a long history of cadaver tombs, though not as many examples or varieties survive as in England. One of the earliest and anatomically convincing examples is the gaunt cadaver effigy of the medieval physician Guillaume de Harsigny (d. 1393) at Laon. Kathleen Cohen lists many other extant examples. There was a revival in the Renaissance, as testified by the two examples to Louis XII and his wife Anne of Brittany at Saint-Denis, and of Queen Catherine de Medici who likewise had her husband Henry II buried in a cadaver tomb. A total of 11 cadaver tombs have been recorded in Ireland, many of which are no longer in situ. The earliest complete record of these monuments was compiled by Helen M. Roe in 1969. One of the better known examples of this tradition, is the monumental limestone slab known as 'The Modest Man', dedicated to Thomas Ronan (d. 1554), and his wife Johanna Tyrry (d. 1569), which currently resides in the Triskel Christchurch, Cork City. This is one of two examples that have been recorded in Cork, with the second residing in St. Multose Church in Kinsale. Arnolfo di Cambio was an Italian architect and sculptor. A monumental brass is a type of engraved sepulchral memorial which in the 13th century began to partially take the place of three-dimensional monuments and effigies carved in stone or wood. Made of hard latten or sheet brass, let into the pavement, and thus forming no obstruction in the space required for the services of the church, they speedily came into general use, and continued to be a favourite style of sepulchral memorial for three centuries. The Basilica of St. Mary of the Altar of Heaven is a titular basilica in Rome, located on the highest summit of the Campidoglio. It is still the designated Church of the city council of Rome, which uses the ancient title of Senatus Populusque Romanus. The present Cardinal Priest of the Titulus Sanctae Mariae de Aracoeli is Salvatore De Giorgi. Filleigh is a small village, civil parish and former manor in North Devon, on the southern edge of Exmoor, 3 1/2 miles west of South Molton. The village centre's street was, until the 1980s opening of the North Devon Link Road, the main highway between the North Devon administrative centre of Barnstaple and South Molton, leading westwards to Taunton. Much of the village's land is contained within grade I listed park and garden, Castle Hill, which straddles both sides of the Link Road providing a glimpse of some of it. The Tomb of Antipope John XXIII is the marble-and-bronze tomb monument of Antipope John XXIII, created by Donatello and Michelozzo for the Florence Baptistry adjacent to the Duomo. It was commissioned by the executors of Cossa's will after his death on December 22, 1419 and completed during the 1420s, establishing it as one of the early landmarks of Renaissance Florence. According to Ferdinand Gregorovius, the tomb is "at once the sepulchre of the Great Schism in the church and the last papal tomb which is outside Rome itself". A tomb effigy, usually a recumbent effigy or in French gisant is a sculpted figure on a tomb monument depicting in effigy the deceased. Such compositions, developed in Western Europe in the Middle Ages, continuing into Renaissance, and early modern times, and still sometimes used. 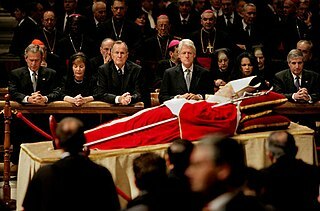 They typically represent the deceased in a state of "eternal repose", lying with hands folded in prayer and awaiting resurrection. A husband and wife may be depicted lying side by side. An important official or leader may be shown holding his attributes of office or dressed in the formal attire of his official status or social class. The Della Rovere or Saint Jerome Chapel, otherwise the Chapel of the Nativity is the first side chapel in the south aisle of the Basilica of Santa Maria del Popolo in Rome. It was dedicated to the Virgin and Saint Jerome and decorated with the paintings of Pinturicchio and his pupils. It is one of the best preserved monuments of quattrocento art in Rome. The Costa or St Catherine Chapel is located in the south aisle of the Basilica of Santa Maria del Popolo in Rome. This is the fourth side chapel from the counterfaçade and was dedicated to St Catherine of Alexandria. The lunettes were painted by the helpers of Pinturicchio and the marble altar-piece is attributed to Gian Cristoforo Romano. The Montemirabile or Saint John the Baptist Chapel, otherwise the Baptistery is the first side chapel in the left aisle in the Basilica of Santa Maria del Popolo. Monuments in the Basilica of Santa Maria del Popolo are tombs and funerary monuments ranging from the 15th to the 19th centuries. Since its rebuilding in the 1470s by Pope Sixtus IV the Basilica of Santa Maria del Popolo was one of the favourite burial places for members of the papal aristocracy, clergy and literati. Foreign artists were also buried in the church due to its location near their favourite quarter in Rione Campo Marzio. The high number of tombs and monuments makes the basilica a whole museum of sculpture as Jacob Burckhardt phrased it in his famous guide of Italian art in 1855. Besides the tombs in the side chapels and the choir there are many other funeral monuments in the aisles and the transept. Conrad Meit or Conrat Meit was a German-born Late Gothic and Renaissance sculptor, who spent most of his career in the Low Countries. A ledger stone or ledgerstone is an inscribed stone slab usually laid into the floor of a church to commemorate or mark the place of the burial of an important deceased person. The term "ledger stone" derives from the German word legen, meaning to lie. Ledger stones may also be found as slabs forming the tops of tomb chest monuments. The monumental brass of John Rudying is a brass of 1481 to Archdeacon John Rudying in the Church of St Andrew in Biggleswade in Bedfordshire noted for the surviving Figure of Death. The monument was rediscovered under the chancel floor in 1955 during restoration and has been described as "very remarkable" by English Heritage. ↑ Cohen, Kathleen (1973). Metamorphosis of a Death Symbol: The Transi Tomb in the Late Middle Ages and the Renaissance. Berkeley: University of California Press. ↑ Panofsky, Tomb Sculpture (New York) 1964:65. ↑ Sophie Oosterwijk, "Food for worms - – food for thought. The appearance and interpretation of the “verminous” cadaver in Britain and Europe", Church Monuments, 20 (2005), 40-80, 133-40. ↑ Sophie Oosterwijk, "“For no man mai fro dethes stroke fle”. Death and Danse Macabre iconography in memorial art", Church Monuments, 23 (2008), 62-87, 166-68. ↑ The Brightwell Baldwin slab is discussed by Sally Badham in her essay "Monumental brasses and the Black Death - a reappraisal', Antiquaries Journal, 80 (2000), 225-226. ↑ Pamela King examines the phenomenon of English cadaver tombs in her essay "The cadaver tomb in the late fifteenth century: some indications of a Lancastrian connection", in Dies Illa: Death in the Middle Ages: Proceedings of the 1983 Manchester Colloquium, Jane H.M. Taylor, ed. ↑ Jean Wilson, "Go for Baroque: The Bruce Mausoleum at Maulden, Bedfordshire", Church Monuments, 22 (2007), 66-95. 1 2 3 Scott, Leader (1882). Ghiberti and Donatello with Other Early Italian Sculptors. London: Sampson Low, Marston, Searle, and Rivington. pp. 27–50. 1 2 "Guide to Rome." Online at: http://www.romecity.it/Berninieglialtri.htm. ↑ Roe, Helen M. (1969). "Cadaver Effigial Monuments in Ireland". The Journal of the Royal Society of Antiquaries of Ireland. 99: 1–19. JSTOR 25509699.